Almost everyone has fond memories of being pushed on a swing as a child. “Higher, Mummy!” Higher, Daddy!” Didn’t you just love the sensation of soaring towards the clouds with pointed toes and beaming faces, giggling as you glided higher and higher? These garden swings for children are a great way to entertain your children. Available with multiple options, the addition of a swing set will add hours of enjoyment to your children’s play and recreation time. For your tiny tot there’s a baby swing; cocooned in a purpose-built swing to support their head and strap them in tight, your baby will love the feeling of air rushing past them as you gently rock them back and forth on the swing. For the upwardly mobile, there is a small or large swing seat, dependent on age, for them to swing upon. Using a swing will improve your child’s dexterity, coordination and will assist in muscle development as your child grows and develops. For the cheeky monkey in your garden, the addition of monkey bars or ring trapeze will be welcomed as they challenge themselves to get all the way across without you holding onto them. Building upper body strength, training better hand/eye coordination and encouraging your children to spend more time outside in the fresh air. As an alternative to the traditional swing style, you can also choose from twist disk or sling style swing. 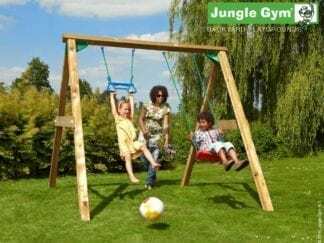 All timber supplied for the use of the jungle gyms is Scandinavian Russian ‘sawfalling’ whitewood. All timber is FSC certified and is guaranteed for 10 years against mould and insect infestation.